Kay has worked her socks off to produce stamps with coordinating stencils, but as you will see, all 6 items coordinate beautifully together, so no need to restrict yourself just to the pairing suggestions below. 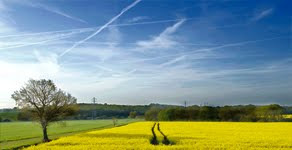 Kay will be joined by Debs Wainwright tomorrow - they both have plenty of ideas with all these goodies. 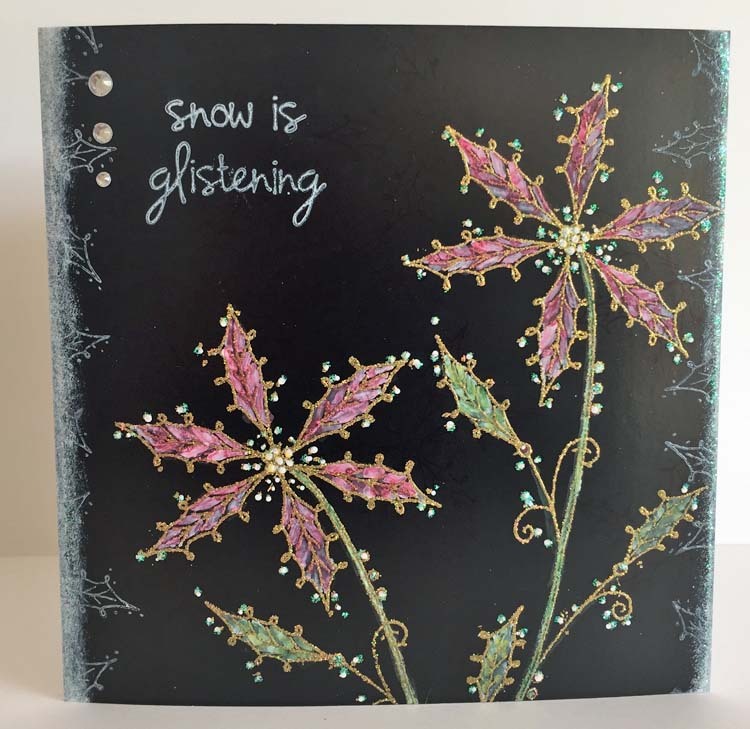 All these new products are available from your PaperArtsy stockists now. See the list at the foot of this post. Hi everyone, Kay Carley here. 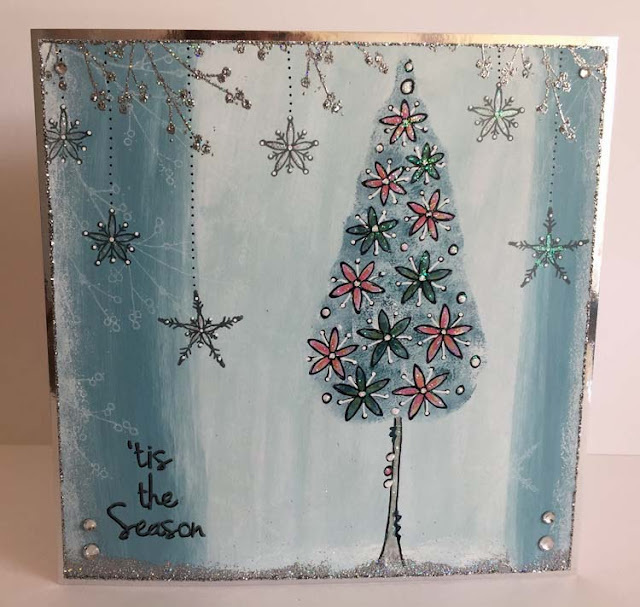 As you can see, this year, I have mixed my style up a little bit with a holly flower stamp set, a holly tree, a snowflake tree and a flower tree and finally a set of Scandinavian style trees. Tonight I wanted to give you a sense of what I might get up to with these stamps, but tomorrow, you'll get more lovely inspiration from Debs. Let's take a closer look at each set, and see what the possibilities could be! First up is my holly flower set. 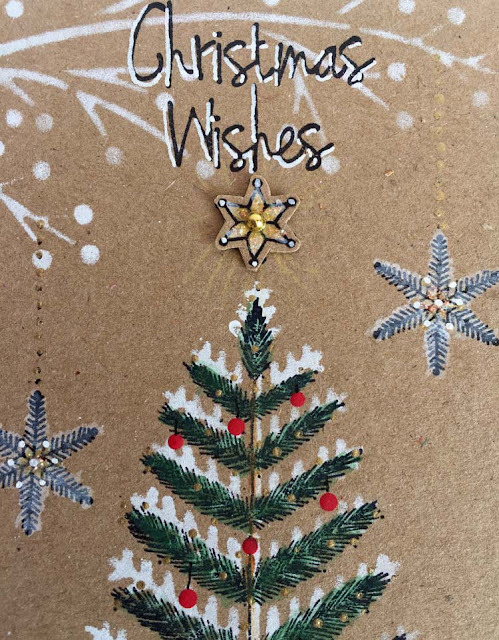 This has a separate holly flower head which can be used for backgrounds, borders, a smaller holly flower (just simply draw in a stem for it) as well as being useful for adding a 3D layer to the larger holly flower (see below). The berry branch stencil was really designed to go with all of the stamp sets - think about using it for backgrounds, borders etc....as well as across the top of the card to hang things from such as snowflakes etc... 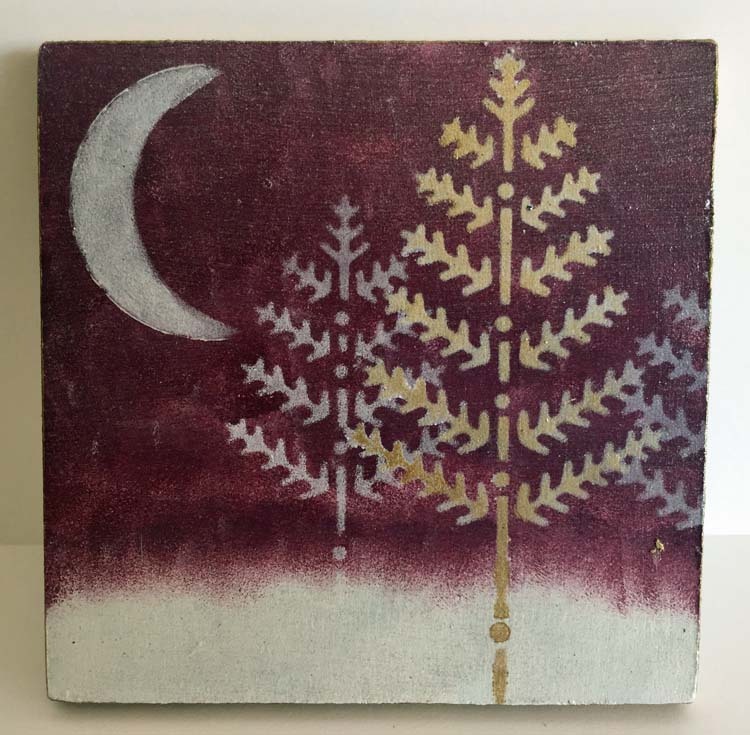 They are also great to stencil along the base or sides of your project to help add depth and perspective. 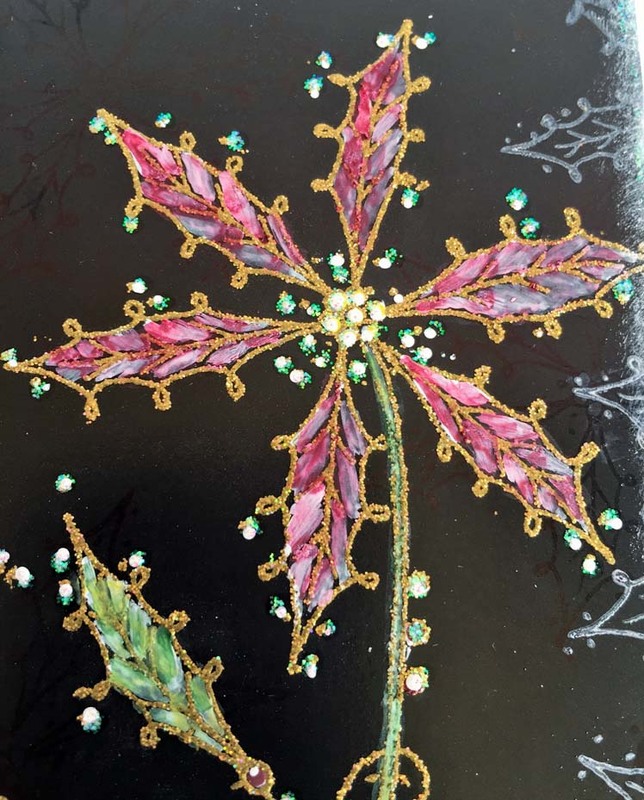 This is what I was referring to above - using the smaller separate holly cluster to create a dimensional flower simply by stamping it onto a separate piece of card, cutting it out and adding onto the holly flower with either glue gel or 3D pads. The flower holly on this stamp set is quite large so you could simply just stamp and emboss this in gold or silver along with a sentiment onto white card and have a quick yet elegant Christmas card. 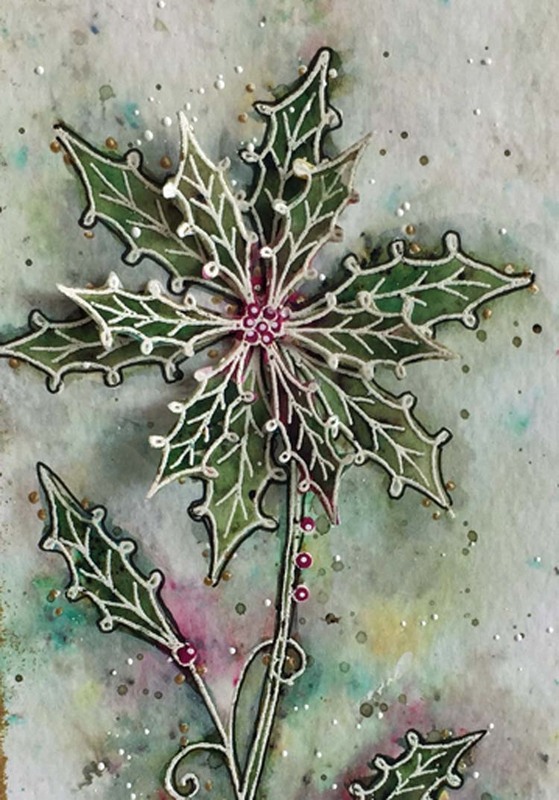 I thought by colouring the holly flower in red it made it look more like a poinsettia flower! Think about stamping out that smaller holly cluster onto scrap card, cutting it out and overlaying it to create a more realistic and dimensional poinsettia flower. There are just so many things you can use the berry stencil for - here I've used it just to decorate a coaster. 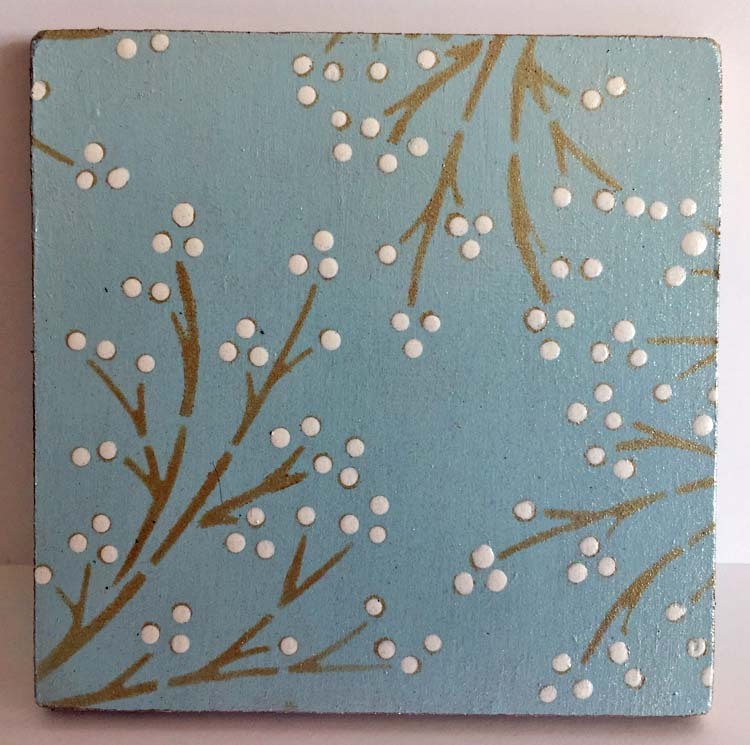 I chose a modern colour scheme for my berry coaster but think how fab this would look in red, green and gold or tone on tone. Now I must admit that when you see the stencil on it's own it does look a bit weird! 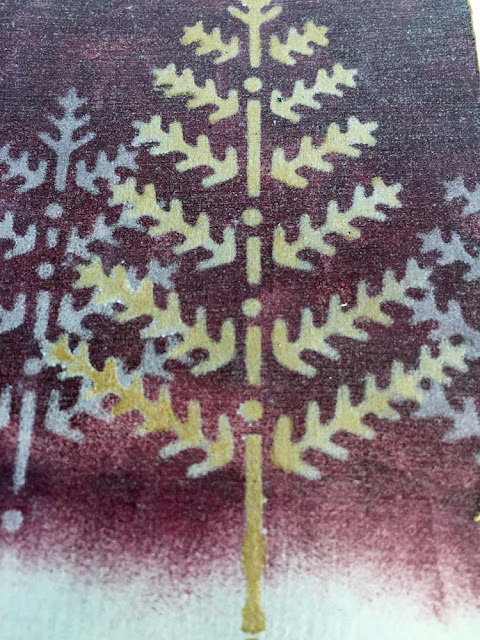 This stencil is what I call my 'tree blob' stencil. 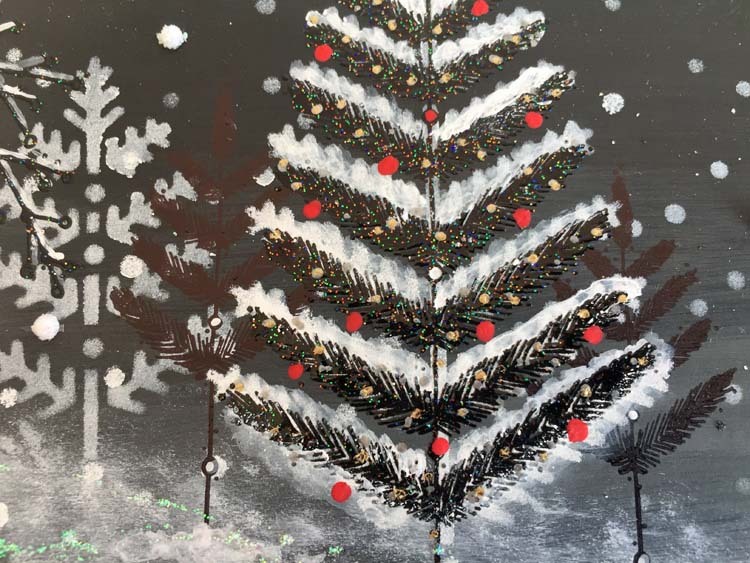 It was designed to create a background shape for the trees as they have been perfectly sized to correspond to the co-ordinating stamps. Simply decide where you want your trees to go, place the stencil into position and sponge your background colour through the relevant shape then stamp your co-ordinating tree over the top :) You can also use the 'tree blobs' to create an outline for the stamped trees by taking a fine-liner pen and drawing around the shape which gives the stamped trees a totally different look! The little dots on the stencil are to represent snow - I didn't take these all the way down to make sponging through the 'tree blob shapes' easier so to have more snow just reposition the stencil. What I particularly like about this stamp set is that all the trees are of a good size but not too big that they can't all be used together. I thought it would be nice to show how you can use the trees quite quickly and simply without any need for colouring or using the co-ordinating stencil thus allowing for fairly quick cards to be created simply by stamping and embossing the imagery. 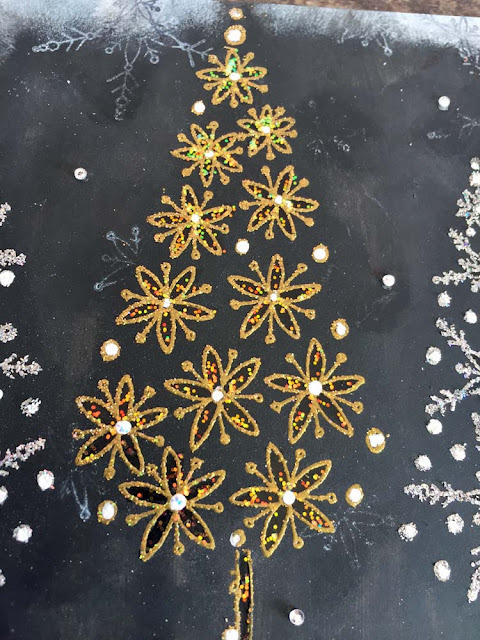 This shows just how different the flower tree can look when it is used in conjunction with the matching stencil. 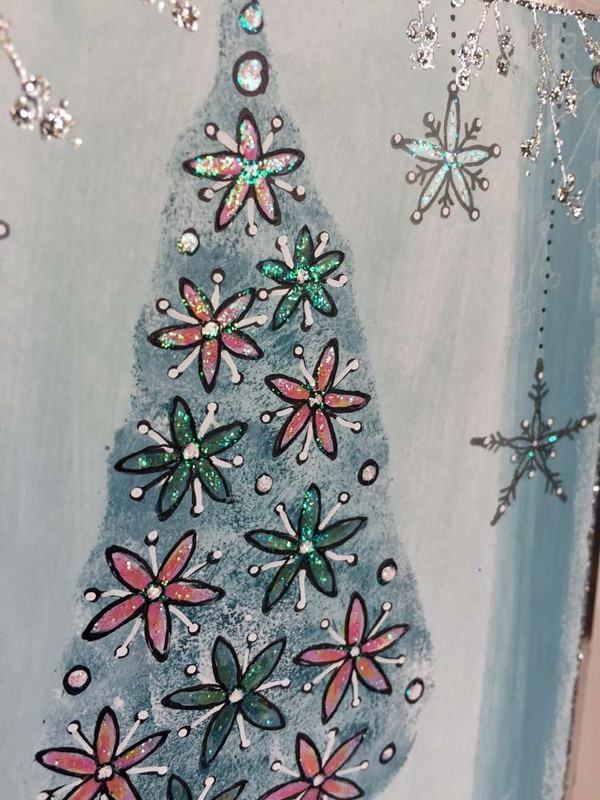 I sponged through two different colours for my background but you can really play around with this by using several colours to create a multi-coloured tree, or a stripey tree or of course you can just use one colour. Lots of possibilities ;)!! It's amazing how different the imagery can look on this particular stamp set depending on whether you stamp the trees and colour them in, stamp and emboss them and add the 'background blob' to them or not! 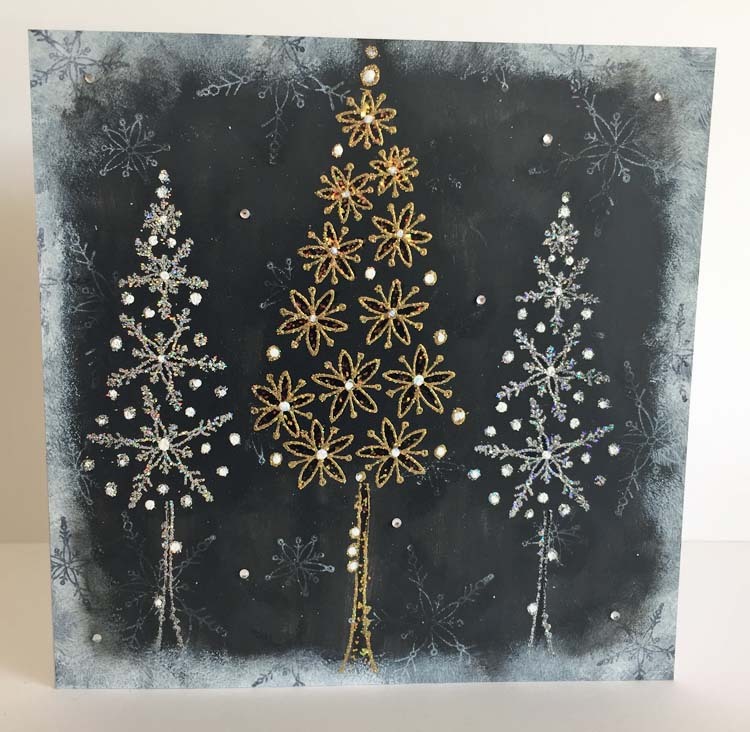 I chose to use the 'background blobs' from the stencil for these trees and although the 'tree blob' stencil has some 'falling snow' included, I opted to use the snowflake stencil for my background on this card to give you an idea just how well the stencils all mix and match together. 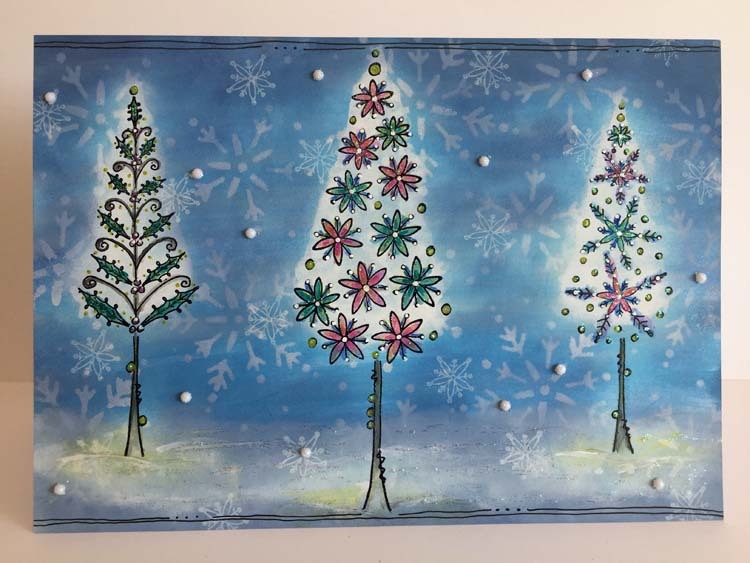 I had a particular image in my head when I designed these two products of wanting to be able to create winter landscapes with depth and dimension hence the three different sizes of trees! 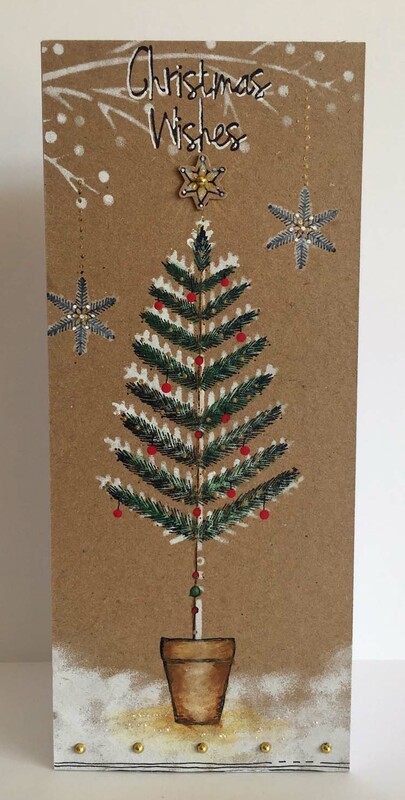 I also felt it was important to have a little tree, a medium sized tree and a big tree so that different sized cards could be created using the same concept as I know that some people like to create smaller cards for Christmas and others like to go for BIG statement sized cards! 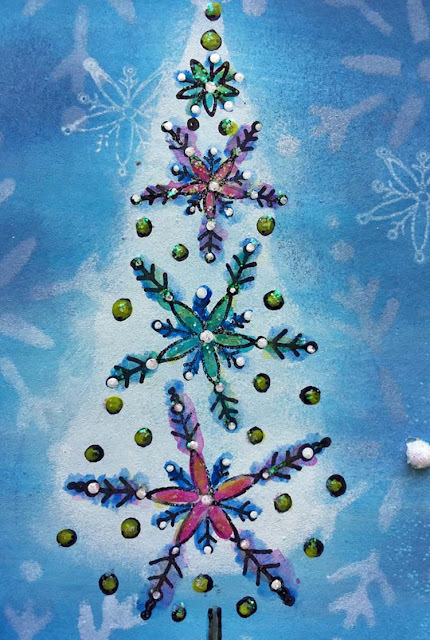 I 'mixed and matched' stencils again for this card choosing to use the berry branch stencil to hang my snowflakes from rather than the berry branch stamp included in the set as the stencil version is much larger and therefore gave more impact. 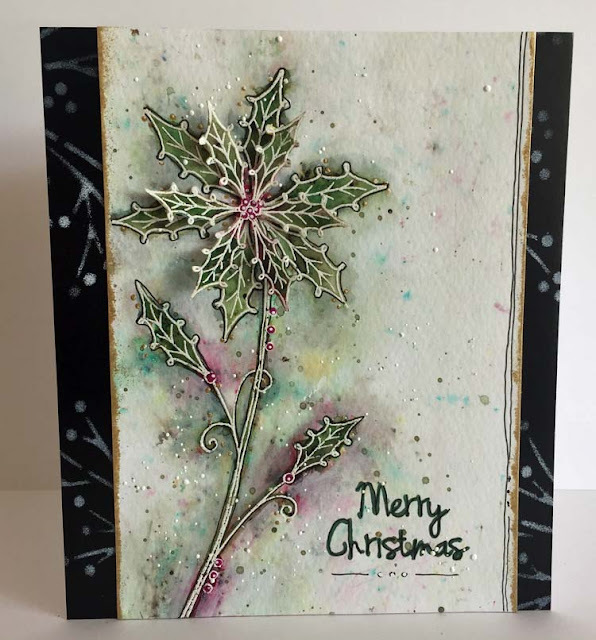 This shows just what depth can be created when using the stencils and stamped images together. 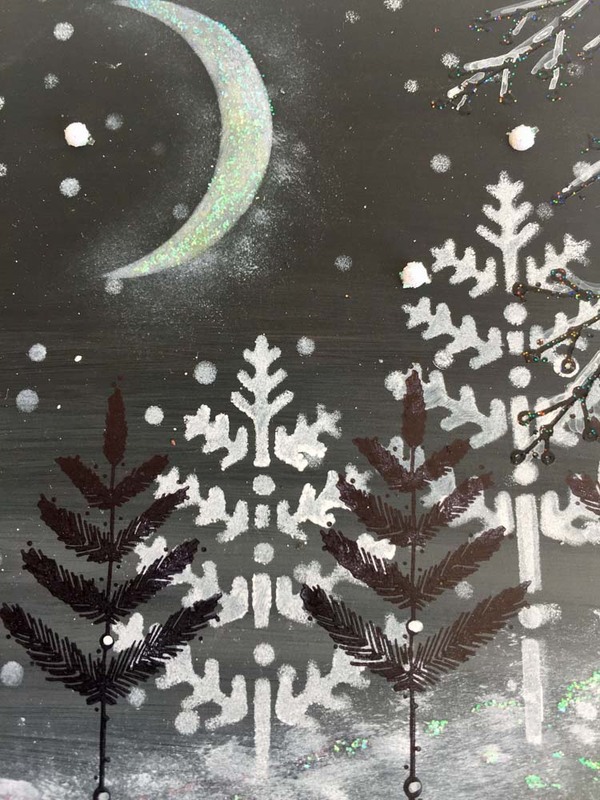 This was exactly the type of card I had in mind when I designed these two products and I love how I was able once again to mix in another stencil (PS069) for my snow. 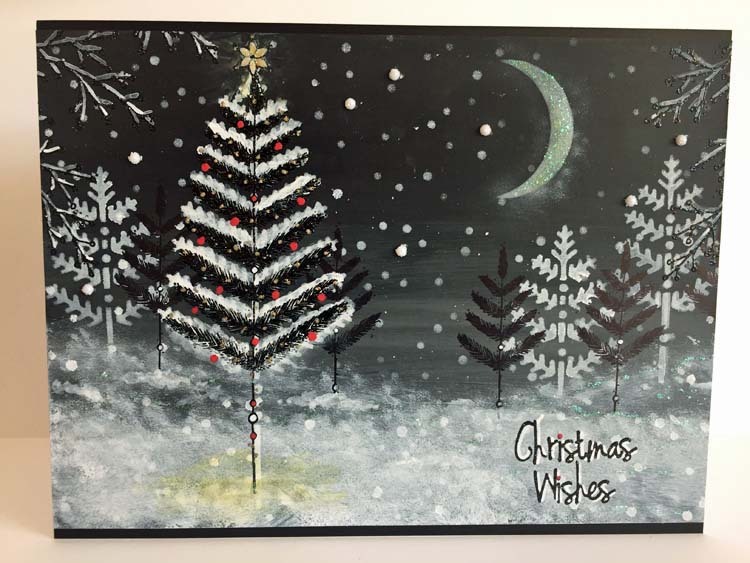 I purposely didn't draw any 'hanging baubles' onto these trees, as I thought it is easy to add your own if you want to, simply by adding a blob of paint which is how I created my red baubles here or they could be red lights................it's open to interpretation! The stencil really works well just on its own and all sorts of different 'moons' can be created thanks to having the mask part of the circle too! 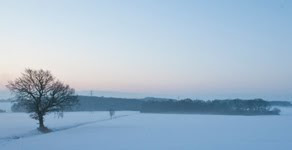 Not exactly a traditional sky colour used here but I thought it would be nice to go with something different! I'm also wanting to try out a bright pink background with stencilled black and silver trees! Lastly.........although these stencils have been designed to match EKC04 and EKC02 stamp sets they can be used on their own too as well as mixed and matched throughout my other designs. 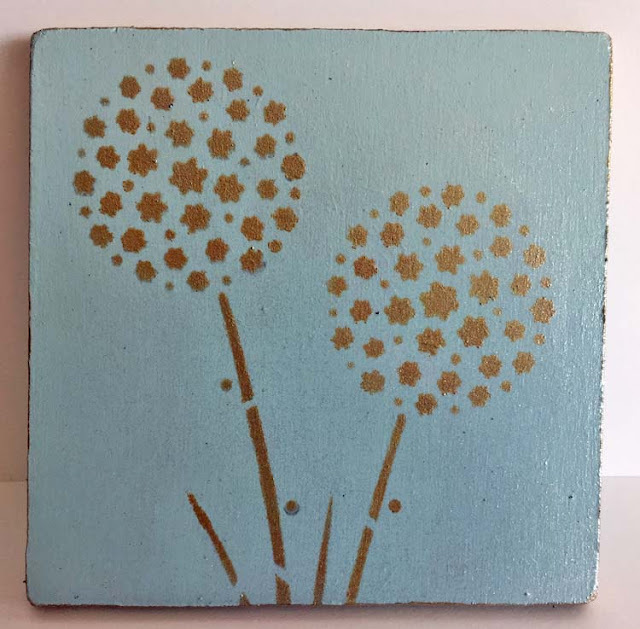 There are just so many different colour combinations that you could use to create this very simple coaster. 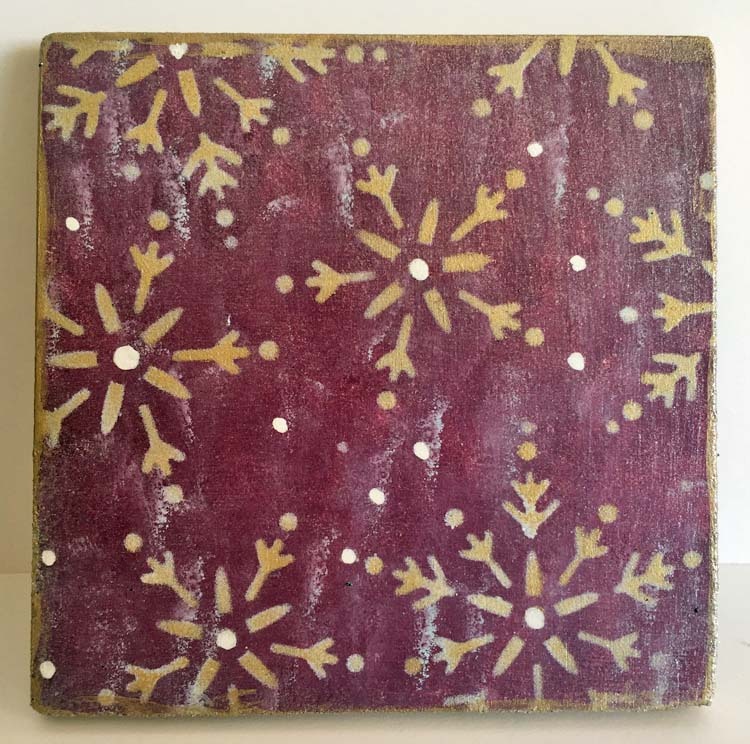 I coated this with a layer of Metallic Glaze which added to the snowy effect I had already created with the background. I really hope you like this latest release and have fun playing with them too - if you do.....let me know as I would love to see what you create!! Wow! 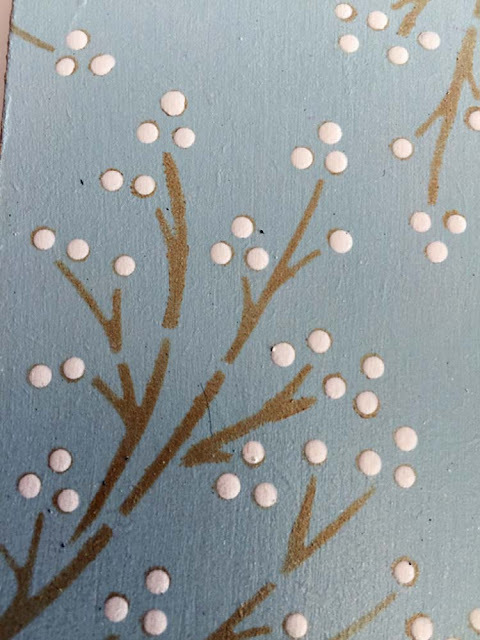 Kay, your new stamps and stencils sell themselves without seeing the samples, but the samples are just beautiful. Gorgeous samples showing just how magical the pairing of stamps and stencils can be - fabulous new images and beautiful work to show them off. I adore these Kay....I am lucky enough to have them already and can't wait to play! A fab new release and lovely samples. Congrats, Kay! Congratulations to Kay on her new releases. They look great, as do the samples.